Keeping all guards and shields in place and well maintained. Heeding the warnings on various decals affixed on equipment. Always disengage the power, shut off the engine, pocket the key, and wait for all parts to stop moving before doing any kind of work on a machine. Below are some common farm equipment hazards to be aware of. These exist where two parts move together, with at least one of them turning in a circle. Examples include chain drives, belt drives, gear drives and feeder rolls. Clothing can become caught and drawn into a pinch point. Never reach into the area near a rotating part. A pinch point can easily sever fingers, hands or other body parts. Accidents happen when a person tries to unclog or feed material by hand into an operating machine. Feed rolls and other machine components are simply too fast to react to, and will pull an operator in before they can let go. These exist wherever there is an exposed, rotating shaft. 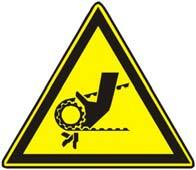 The PTO driveline hazard is one of the oldest and most common farm machinery hazards. At normal operating speeds, clothing is snagged and pulled around the shaft much quicker than a person can pull back or take evasive action. Once the shaft catches material there is no escape. Wrap Points exist wherever there is an exposed, rotating shaft. The PTO driveline hazard is one of the oldest and most common farm machinery hazards. At normal operating speeds, clothing is snagged and pulled around the shaft much quicker than a person can pull back or take evasive action. Once the shaft catches material there is no escape. Shaft ends which protrude beyond bearings. Splined, square and hex‐shaped shafts are most likely to wrap hair or clothing, but even the smoothest rotating shaft can grab and wrap. Couplers, U‐joints, keys and other fasteners on shafts increase the wrapping hazard. Exposed beaters and pickup reels are also a wrapping threat. These exist where the edges of two components move across each other like scissors. Shearing and cutting devices are widely used on harvesting equipment. The active parts may rotate (rotary mower) or reciprocate (sickle bar). Cutting and shear points also exist on several devices that are not designed to cut material, such as auger flighting entering a tube. Some farm machines can propel objects great distances with tremendous force. Rotary mowers and flail choppers can hurl small stones and other debris. Combine straw choppers and hammer mills can fling kernels and other crop material with considerable force. Parts on farm equipment may continue to rotate for two minutes or more after power is disengaged. Injury occurs when an impatient operator reaches in to unclog or service the equipment before the free‐moving part stops. These are created when two objects move toward each other, or when one object moves toward a stationary item. A crush point exists between an implement tongue and tractor drawbar. Other examples include jacked‐up equipment, raised hydraulic components and overhead doors.Recognize the hazards and follow safe practices to prevent farm equipment accidents, first learn to recognize the hazards that these machines present, then develop safe practices to ensure there is no contact with operating or moving machinery.